…it’s possible to HIDE it in the mix. Before I continue, I must reiterate again (in case you’re new), when it comes to recording and mixing music, it’s always better to fix things on the front end, to deal with issues during the recording phase, rather than leaving them to be fixed later. Because reality is you CAN’T fix it in the mix. It will still be broken. But…there are times where you have no option but to at least try to hide the problems of a particular track in the mix. For me it happens occasionally when I mix a song someone else recorded. Since I have no option but to use the tracks in front of me, I’ve learned lots of ways to make less-than-perfect tracks hide themselves well in the mix, still being heard, but not revealing their flaws. But for two lines in the song the instrumentation drops down pretty dramatically, and the buzz makes an appearance. So I figured out a way to use a combination of plugins (distortion and delay) to create a new vocal sound for that section, a sound that helps hide the buzz. Anyway, the lesson here is that while you can’t fix problems in the mix, you can sometimes hide them, if you have to. 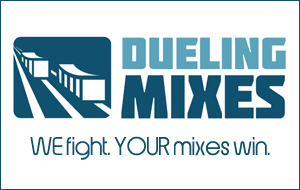 To see how I did it, you’ll need to become a Dueling Mixes member. Want a sneak peek before you join? Okay, fair enough.